The Parent House offers a range of learning and support for parents and carers from the local community. Along with a new identity, they needed a new content-managed website. The existing site was not being used much, and we had no analytics to work with. * The initial prototype was very simple, line drawn style to just get everyone thinking about the site structure and content areas. After that I made one with a bit more definition. After a process of feedback and iteration in our team and from the client, we were all confident we were heading in the right direction. We began to start crafting new content for the site along with generating more developed options for the design direction for the site. We held regular UX reviews and got feedback on the content requirements for the new site. We then moved into the final build and design phase for the site, with tech, design, content and UX working together to shape up the User Interface. We had a user testing session at the client site once we had a functioning build with the bulk of our content, to identify any major issues and get feedback from parents and stakeholders. I’m really proud of this work – we had a great team and a wonderful client and parents keen to give us time to input into the final product. 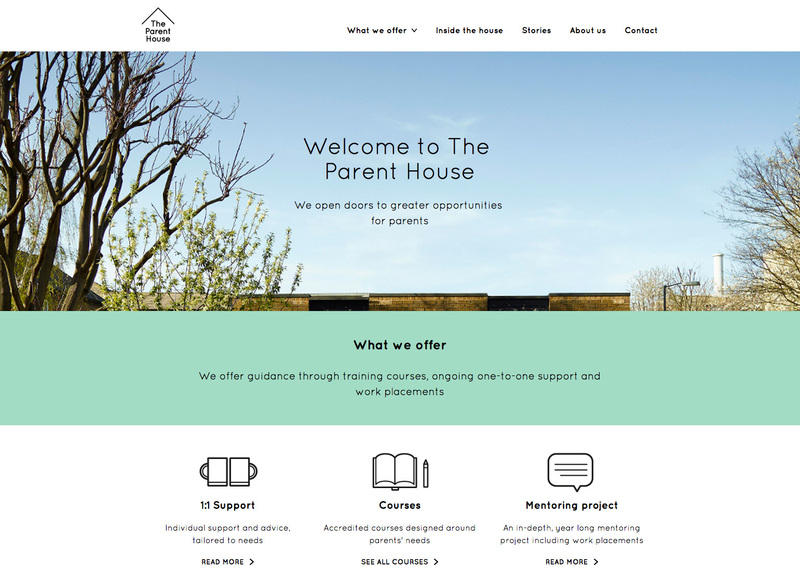 The feedback so far has been that we have built a more modern and focused site, and the website communicates the essential nature and services of The Parent House – and makes it easy to contact them.